Rory McIlroy admits he has "unfinished business" and "should have adopted a more mature approach" rather than walking off as he played his 27th hole in last year's Honda Classic. World No 1 at the time, the then 23-year old was seven over par through eight holes when ge walked in after hitting into the water for the third time in the course of a torrid morning. In a statement issued through his management company (via his current tour manager) at the time, he later said that a wisdom tooth problem had led to his sensational decision to high tail it out of the event. He apologised at the following week's WGC-Cadillac Championship, explaining: "I realised pretty quickly that it wasn't the right thing to do. No matter how bad I was playing, I should have stayed out there. I should have tried to shoot the best score possible even though it probably wasn't going to be good enough to make the cut. "At that point in time, I was just all over the place, and you know, I saw red, as I said, and you know, it was a mistake and everyone makes mistakes and I'm learning from them. I guess for me, some people have the‑‑ I guess the pleasure of making mistakes in private. Most of my mistakes are in the public eye. So it is what it is, and I regret what I did. But, you know, it's over now and it won't happen again." Late last year he admitted that his off-course management and legal problems might have had something to do with his Honda walk out. But in committing to this year's event at PGA National Resort & Spa from February 24-March 2, he was again contrite about his actions nearly 12 months ago. "Last year, admittedly, I had a tough week; a forgettable week," he is quoted as saying in an official press release issued by the Honda Classic today. "I guess I let frustrations get the better of me and perhaps should have adopted a more mature approach. After showing signs that he is close to his best form, he said: "I really can't wait to get back to The Honda. It is one of my favourite events of the year, and winning in 2012 was an important landmark in my career. "Having a place in Palm Beach now also gives the tournament a kind of special feeling. - nearly like a home event." 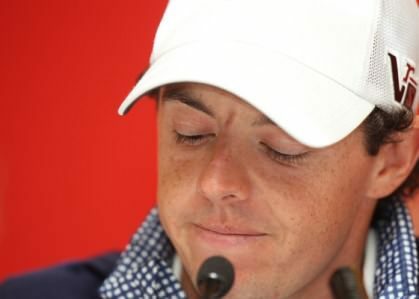 McIlroy will take on another world class field in The Honda which already includes fellow Top 10 players Adam Scott (No. 2), Zach Johnson (No. 6) and Sergio Garcia (No. 9). Graeme McDowell has also officially committed while Padraig Harrington is also expected to play. "I feel good about my game and feel like I'm back to the place that I want to be," McIlroy said. "I'm driving the ball well, hitting the ball solid and giving myself plenty of chances for birdies. And if I can keep doing that, the wins will come. "Things are really looking good and I'm in a really good frame of mind. I've done some good work and felt like it was coming together for me at the end of last year. "I had a good off-season and worked hard on a few things, and it's good to see that that's coming out on the golf course and I'm starting to hit the ball very well. I feel like I'm starting this year on such a different sort of platform. "Everything feels like it has fallen into place and I can just focus on my golf. I'm just really excited to start 2014 and get back to playing the golf that I know that I can." Rory McIlroy made a 310 yard walk from the 18th to his car, clearly upset about his play. Ernie Els criticised Rory McIlroy for his Honda Classic walk-out - then showed the youngster some compassion as he recalled a meltdown of his own.